The Chad Valley Adventure Play Zone is easy to get ready. 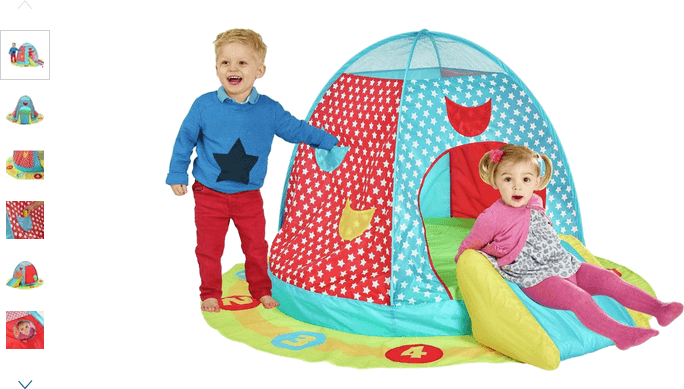 With a pop up tent your most cherished will adore this brightly coloured exploratory adventure soft inflatable play zone whether they’re on the crawl navigating through the door and down the super soft inflatable slide or playing hide and seek through the beautifully textured baby friendly mesh roof. The Chad Valley Adventure Play Zone encourages babies to explore their surroundings and you’ll enjoy seeing that exploration as their sensory elements are stimulated as they create noises on the crinkle fabric, squeaking and playing. Active play of this nature builds a baby’s confidence and assists physical development as they navigate the soft play zone. Get money off with April 2019 free Argos voucher codes, see if there's a promo code for the Chad Valley Adventure Play Zone product. Argos may be out of stock of this product. To enhance your shopping experience you may also be redirected to a search results page when you click an outbound link.